How much emphasis is found in the writings of the Old Testament prophets on the subjects of the Restoration and the last days? What was religion for the Israelites? What were the false ideologies, values, and practices that tempted Israel during the Old Testament period? About twenty-five miles southwest of Jerusalem in Lehi’s day lay the powerfully fortified city of Lachish, the strongest place in Judah outside of Jerusalem itself. Founded more than three thousand years before Christ, it was under Egyptian rule in the fourteenth century B.C. when the Khabiri (Hebrews) had just arrived. At that time, its king was charged with conspiring with the newcomers against his Egyptian master. A later king of Lachish fought against Joshua when the Israelites took the city about 1220 B.C. In a third phase, either David or Solomon fortified it strongly. The bonfire was probably set by the soldiers of Nebuchadnezzar because they wanted to bring down the wall, which enclosed the gate to the city. Nebuchadnezzar had to take the city because it was the strongest fortress in Israel and lay astride the road to Egypt, controlling all of western Judah. Jeremiah tells us that it and another fortified place, Azekah, were the last to fall to the invaders. (See Jer. 34:7.) An ominous passage from Lachish Letter No. 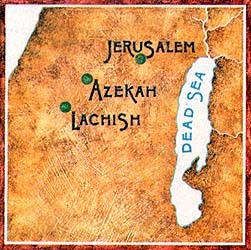 4:12–13 reports that the writer could no longer see the signal-fires of Azekah﻿—that means that Lachish itself was the last to go, beginning with the guardhouse in flames. The letters survived the heat because they were written on potsherds. They were written on potsherds because the usual papyrus was unobtainable. It was unobtainable because the supply from Egypt was cut off. The supply was cut off because of the war. The letters were in the guardhouse because they were being kept as evidence in the pending trial of a military commander whose name was Hoshacyahu. He was being court-marshalled because he was suspected of treason. He was suspected of treason because someone had been reading top-secret dispatches sent from the court at Jerusalem to the commander at Lachish, whose name was Yaush. Hoshacyahu was a likely suspect because all the mail had to pass through his hands. It had to pass through his hands because he was in command of a fortified town on the road between Jerusalem and Lachish, probably Qiryat Ye’arim. His duty, among other things, was to forward the king’s mail﻿—not to read it. That the confidential letters had been read was apparent because somebody had tipped off a certain prophet that he was in danger. He was in danger because the king’s soldiers had been put on his trail. They were on his trail because he was fleeing to Egypt. He was fleeing because he was wanted by the police in Jerusalem. He was wanted by the police because he and other prophets were considered by the king’s supporters to be subversives. They were considered subversives because they were opposing the official policy and undermining morale by their preaching. As Jeremiah puts it: “The princes [the important people] said unto the king: We beseech thee, let this man be put to death: for thus he weakeneth the hands of the men of war that remain in this city, and the hands of all the people, in speaking such words unto them.” (Jer. 38:4.) As Lachish Letter No. 6:6 puts it: “The words of the [prophet] are not good [and are liable] to loosen the hands.” The Book of Mormon adds another reinforcement: “In that same year there came many prophets, prophesying unto the people that they must repent, or the great city of Jerusalem must be destroyed” (1 Ne. 1:4)﻿—disheartening news, indeed. “And when Jehoiakim the king … heard his words, the king sought to put him to death: but when Urijah heard it, he was afraid, and fled, and went into Egypt. In Letter No. 4:3–4, Hoshacyahu assures his superior in Lachish that he has carried out his written orders to the letter: “According to whatever my lord has sent, so has thy servant done.” Furthermore, “I have written down in the deleth whatever my lord has sent [written] me.” Plainly he copied it down for the official record. Though “the Bible throughout speaks of rolls of writing,” meaning papyrus or, more rarely, parchment rolls (p. 16), Letter 4 specifically uses the rare word deleth for the form in which Hoshacyahu copied down or registered his official correspondence. Torczyner assumed that deleth must refer to a “papyrus sheet,” or “page,” since a deleth is not a roll and is certainly not a potsherd. (P. 80.) An alternative is a tablet or plate of solid material. Even without the archaeological sites, the setting and situation in which the letters were written could be determined by their style as well as their content. They contain “90 lines of clear writing, beautiful language and highly important contents.” (P. 15.) The language is pure Hebrew, most closely resembling that of the books of Jeremiah and of Kings. (P. 17.) They show, to everyone’s surprise that in 600 B.C. “writing was almost common knowledge, and not a secret art known only to a few.” (P. 15.) But they also show that the Egyptian scribal tradition at that particular time exerted a major influence in official record keeping throughout the Near East. The kings who attacked Jerusalem from the east at the time brought “two scribes” with “every expedition,” writes A. T. Olmstead, “the chief with his stylus and tablets, his assistant with a papyrus roll or parchment and Egyptian pen.”2 The assistant was needed not so much for his skill with Egyptian writing materials, which had been introduced quite recently in the time of Tiglath-Pileser III and which anyone could learn to handle, but for the same reason “the court found it necessary to possess an Aramaic scribe”﻿—namely to deal with the language,3 so widespread was the Egyptian tradition of record keeping at the time. Would the Egyptian scribes of a Babylonian or Assyrian king employ their skill to write in cuneiform or any other language but Egyptian? There were plenty of native scribes for that. Though a wealth of cuneiform writings on clay have been found in Egypt, cuneiform writings on papyrus are not known in the East. 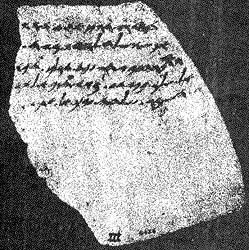 The Lachish letters survived a fire because they were written on potsherds﻿—pieces of pottery. Even more than the language and style of the letters, the proper names they contain in abundance place them in a neat and narrow segment of the time spectrum. They are peculiar names, characteristic of just one period in Jewish history, and likewise peculiar to the Book of Mormon. First, however, we should take note of the most frequently occurring name in the Letters, that of Yaush, the high commander of Lachish, which Torczyner anglicizes as Jaush. The name is not found in the Bible, but it is found in the Book of Mormon where Josh is a high military officer commanding a force of 10,000 troops. (See Morm. 6:14.) Needless to say, in the past critics of the Book of Mormon have made merry in citing it as another example of Joseph Smith’s supposed hayseed mentality. Josh indeed! More important from the Book of Mormon point of view is the peculiar type of names turning up in the Lachish Letters. They are characteristic of just one period in the history of Judah, namely the days of Lehi. Here we have another control over the Lehi story. For the discovery of the Elephantine documents in 1925 showed that colonies of Jews actually did flee to the desert as Lehi did﻿—during Lehi’s lifetime, and for the same reasons. Arriving in their new home far up the Nile, they built a temple similar to Solomon’s temple, exactly as Lehi’s righteous children did upon landing in the New World. Both of these oddities, and especially the temple, were once thought convincing refutations of the Book of Mormon. Fittingly, this king names his eldest son, the great reforming king, Mosiah, suggesting both the early reform of Moses and its later imitation by Josiah. This would be altogether too much of a coincidence were it not that the book of Mosiah fully accounts for the resemblances when it explains just how Nephite names and customs were preserved intact in the transplanting of cultures from the Old World to the New. Lehi’s ties to the Yahvist tradition are also reflected in the only female name given in his history, that of his wife, Sariah. Torczyner suggests that Uriah “may have hidden in the hills of western Judah for a long time” (p. 70), and we find Lehi doing the same thing. Indeed, as Torczyner points out, what we are dealing with here is a type of thing, Uriah’s story being told “only as parallel to Jeremiah’s not less dangerous position.” (P. 69.) To their number we may add Lehi, whose story has every mark of authenticity. The Dead Sea Scrolls have put flesh on these sectarian bones, showing how from the earliest times communities of the faithful would withdraw from Jerusalem to bide their time in the wilderness. The pattern is familiar to readers of the Book of Mormon, who recall that Lehi “went forth among the people” as a prophet (1 Ne. 1:18), but, badly received, he was warned in a dream that his life was in danger and ordered to go into the wilderness, leaving all his worldly things behind (see 1 Ne. 2:1–2). It was the idea behind the Rechabites and the people of Qumran: Nephi, inviting a new recruit to come and “have place with us,” points out to him that only so could he “be a free man like unto us,” and that to “go down in the wilderness” was the only way to “be diligent in keeping the commandments of the Lord.” (1 Ne. 4:33–34.) So Zoram duly takes an oath and joins the company. “Behold, these many years we have suffered in the wilderness, which time we might have enjoyed our possessions and … been happy. Torczyner explains the word by reference to 2 Kings 6:20 [2 Kgs. 6:20], where Elisha asks the Lord to open the eyes of a certain ordinary man so he could see the horses and chariots of fire which otherwise only Elisha could see. As we saw earlier, the sender of nearly all of the Letters is a high military officer suspected by one party of treachery to the king in aiding the prophet, and by the other of betraying the prophet by revealing the contents of his warning letter to the king. (P. 113.) Likewise his superior offricer, Yaush, who has been ordered to investigate him, “appears to be on the best of terms with the king. But still both men respect the prophet and believe in him in spite of the king’s attitude towards him, and their hearts ache that they should be responsible for his destruction.” (P. 113.) The same tragic confusion exists in the Lehi story. Furthermore, the actors in both dramas have ties to the Egyptians. Though Lehi supports the anti-Egyptian party, his sons have Egyptian names and Egyptian educations and they keep their records after the Egyptian manner. Moreover, the party flees toward Egyptian territory. The same anomaly confronts us in the Lachish Letters, which tell of a certain general sent down to Egypt to fetch a prophet back to Jerusalem for execution. (P. 63.) But why on earth, asks Torczyner, would the good man flee to Egypt of all places, when his crime was supporting Jeremiah in calling “for peace with Babylonia?” Our informant finds it “astonishing” that he fled towards Egypt instead of Babylonia. Where is the king in all this? In both stories he appears as a rather weak character in the background. As for Yaush, “the king appeals to him in everything concerning this part of the country” (p. 118), that is, the whole western part of the kingdom (p. 87), and Laban would probably have enjoyed the same preference at Jerusalem. 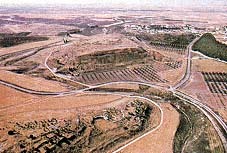 As with Yaush at Lachish, the archives were housed at Laban’s official residence, making him a top candidate for a counselor to the king. Lehi’s sons take Laban’s servant with them, “that the Jews might not know concerning our flight … lest they should pursue us and destroy us.” (1 Ne. 4:35.) Even so we see in the Lachish Letters “a prophet fleeing from his home and friends, a prophet wanted by the military authorities.” (P. 64.) The military correspondence of the Lachish Letters with its grim suspicions of disloyalty and double-dealing, fervid denials, charges, investigations, and reports reminds one of the much later Bar Kochba letters discovered in 1966, which in turn present truly astonishing parallels to some of the military correspondence in the Book of Mormon. One peculiar situation in the Lachish letters casts a good deal of light on an equally peculiar and highly significant episode in the Book of Mormon. Torczyner suggests that “the prophet’s warning letter … could have been sent while the prophet was still near his home town, through a little boy, most suited as an unsuspected messenger.” He remarks that little boys performed such offices in the time of David (2 Sam. 15:36; 2 Sam. 17:17–21) and that “such small boys are used also today in Palestine, often for quite responsible missions” (p 68). This Nedabiah, whose title “may equally well mean the grandson of Jehoiakim as the grandnephew of Zedekiah,” was quite young, “one would prefer the age of 10–13 to that of 5 years” (p. 69), carrying dangerous letters between the towns and camps for the prophet’s people. Since he was carrying letters of warning to people ready to decamp to save their lives at a moment’s notice, he could surely count on escaping with them. When news reached them that the royal family would be wiped out, only one course of survival was open to the child and his friends. Nowhere are we told that Mulek was the leader of the company, and indeed in his apparent youth that would be unlikely. But as the sole survivor of the royal family and heir presumptive to the throne, he was certainly the most important person in the company, a source of legitimate pride to the group. The name tells everything. Mulek is not found anywhere in the Bible, but any student of Semitic languages will instantly recognize it as a diminutive, a term of affection and endearment, meaning “little king.” What could they call the uncrowned child, last of his line, but their little king? And what could they call themselves but Mulekiyah or Mulekites? H. Torczyner, The Lachish Letters: Lachis I (Oxford: Oxford University Press, 1938). Unless otherwise indicated, parenthetical page numbers throughout this article refer to this source. A. T. Olinstead, History of Assyria (Chicago: University of Chicago Press, 1960, p. 583). Hugh Nibley is professor emeritus of Ancient Scripture at Brigham Young University.